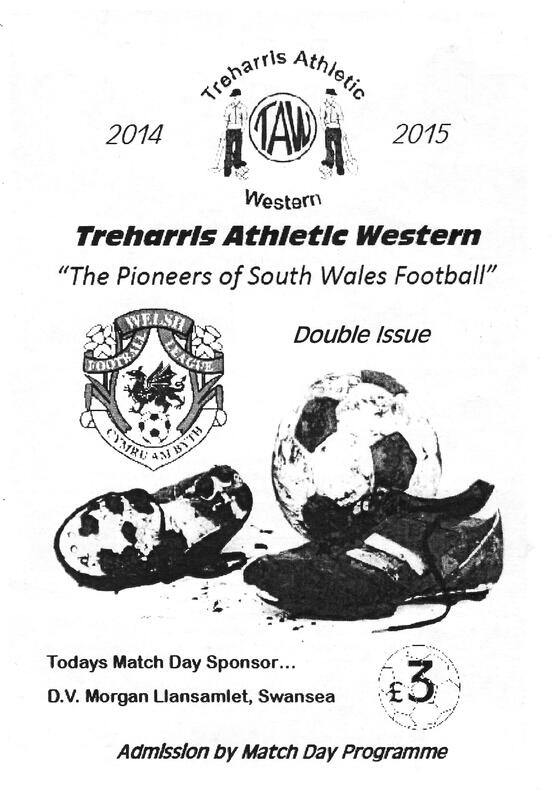 Treharris Athletic and their wonderful Athletic Ground home are veritably steeped in history. 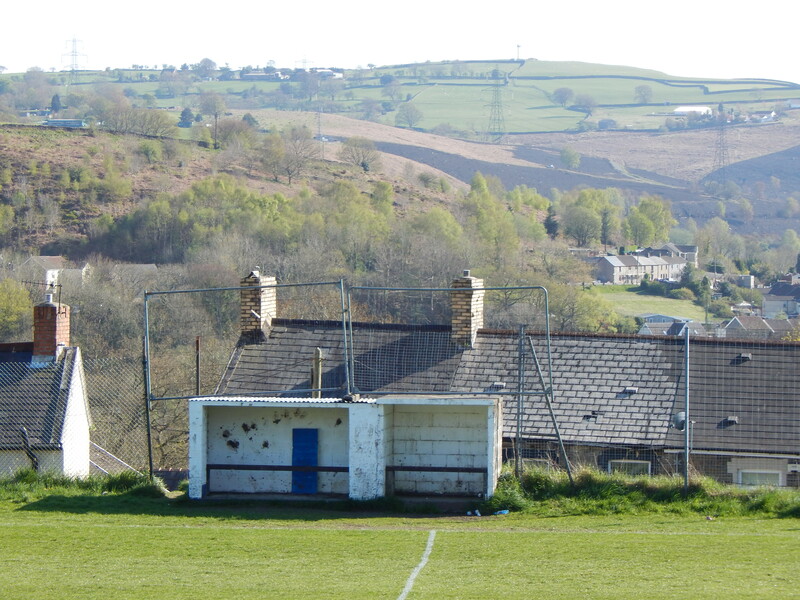 The football club were formed in 1889 and original played at a ground called Graig Berthlwyd. They were well supported drawing support from the inhabitants of the town that had sprung up around the Deep Navigation Colliery named after its owner, F.W.Harris. It was reported that an 1893 match against Cardiff City drew a “large number of spectators” to Graig Berthlwyd. Real pioneers of the round ball game, the club were founder members of the South Wales League in 1890 and won the first two championships and truly dominated the football scene in South Wales. Sometime around 1900 Treharris moved to their new ground off Spencer Place which was christened the “Athletic Ground”. Ton Pentre provided the opposition in the opening match. 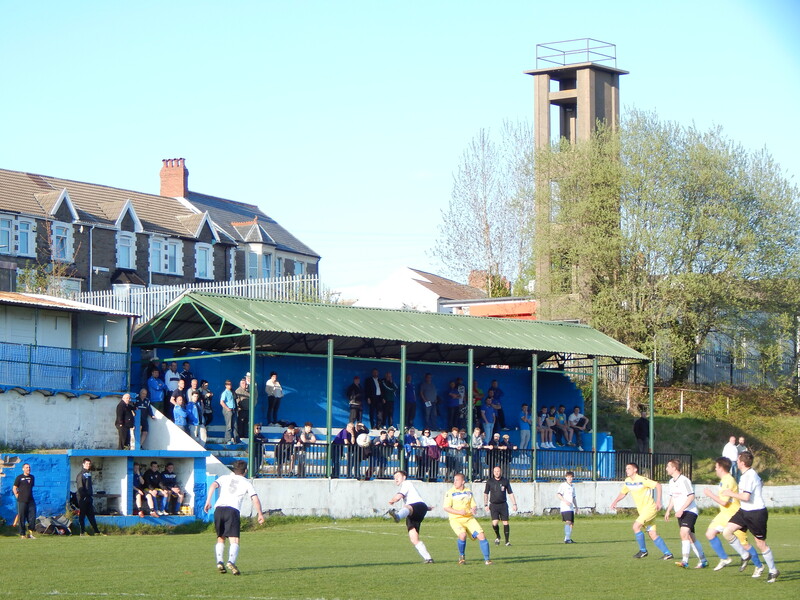 The Treharris first team competed in both the South Wales League and from 1902/03 the Rhymney Valley League before becoming one of the first clubs to compete outside of Wales. This happened in 1906 when Treharris joined the Western League. They also remained in the Rhymney Valley League which would later become the Welsh League. Crowds at the Athletic Ground would frequently top 2,000 spectators. By 1910 the club had become so strong, winning the Western League title in 1909/10, they joined the Southern League Division 2 with the likes of future Football League clubs Cardiff City, Merthyr Town and Aberdare. In April 1912 Treharris’ David Walter Davies was capped by Wales when he played against Northern Ireland at Ninian Park. Davies would later play for Oldham Athletic and Sheffield United. The club remained in the Southern League until finishing bottom of Division 2 at the end of the 1913/14 season. Since those heady days the club has been Welsh League stalwarts but have never replicated their sole championship win in 1910/11. 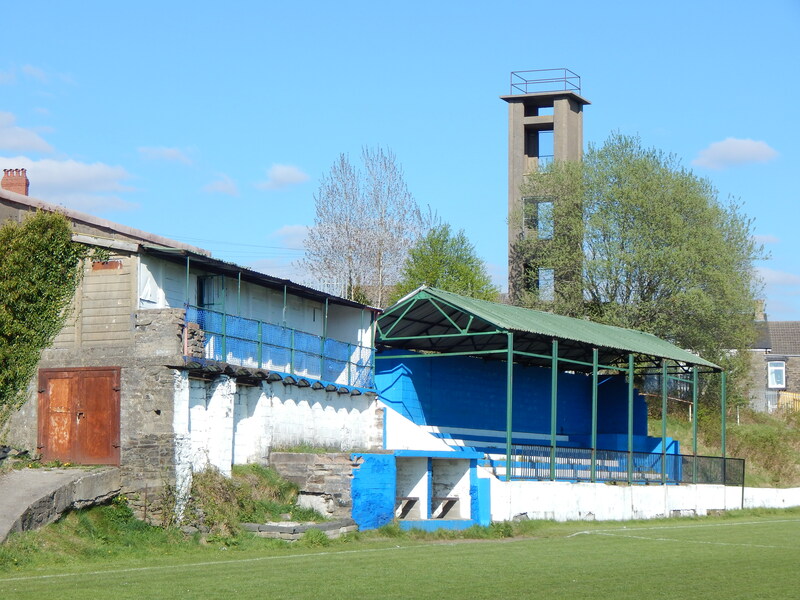 The whole town, let alone the club, was hit when the mine was closed in 1991 and since then the club have laboured in the lower reaches of the Welsh League. Relegation from Division Two was suffered following a bottom placed finished in 2011/12. The following season saw a wretched season for Treharris, finishing next to bottom with only Bettws beneath them. 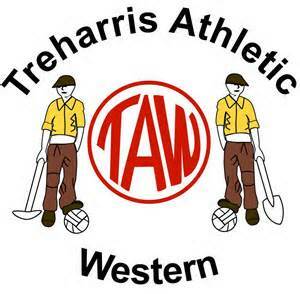 Since 2009/10 the club has been known as Treharris Athletic Western. The Athletic Ground is truly magnificent, probably the only sizable reasonably flat area in the town. All the facilities are on one side of the ground, a small tea bar and changing room building provides a viewing balcony to augment the stunning covered terrace that has peered down over proceedings for over 100 years. 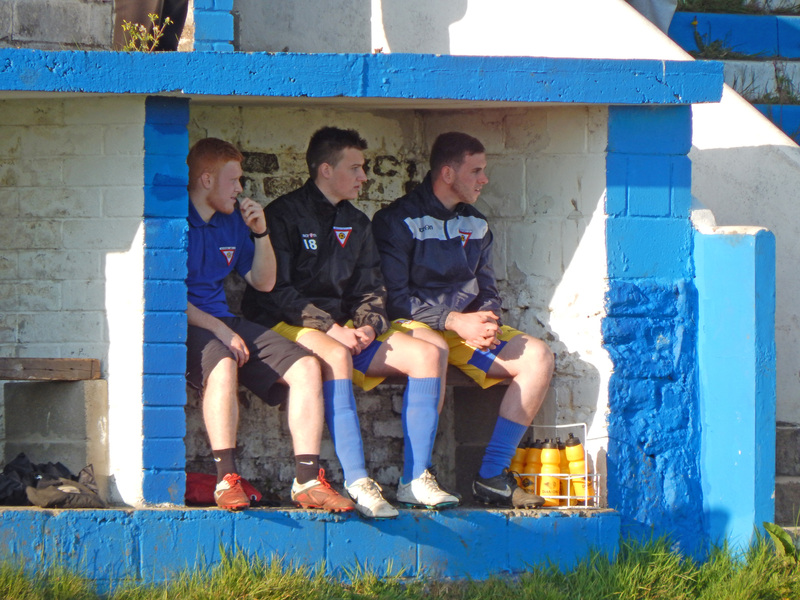 Therein lies the dilemma for a club like Treharris, do they hang on to the vestiges of their glorious past or look to the future? 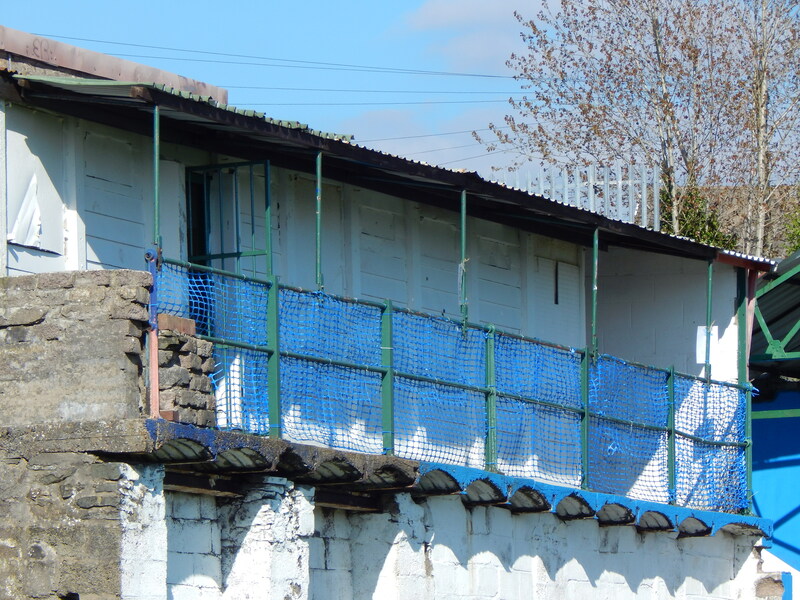 The club has decided to move on and rather than hire the historic venue from the local council they have decided to up sticks and head to nearby Trelewis and take up residence at the Parc Taff Bargoed, vacated by the now defunct Trelewis Welfare club. With improvements underway to bring the facilities up to scratch, this historic club can look forward to a new chapter in their incredible history. Once again this season Treharris have been hovering precariously close to the relegation zone. 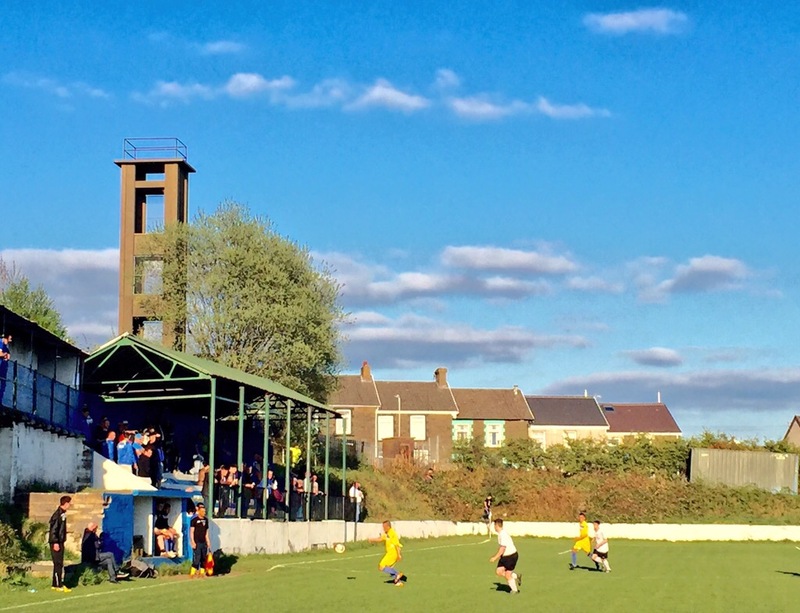 However, recent form has been excellent and tonight Athletic take on Newport YMCA in what is billed as the penultimate match at the historic Athletic Ground. Treharris mean business tonight with skipper Matthew Sellick opening the scoring after just 80 seconds. Second half goals from Brad Jones, Sellick again, and Aaron Caffell right at the death secures a comfortable win and another vital three points in their great escape bid. The Athletic Ground is one of those football grounds that make the hair on the back of your neck stand up. What the council will do with the site once Treharris leave is not clear, one can only hope it survives in some form. Whether the Millennium Park project will be ready for next season remains a mute point but to all intents and purpose this is the last hurrah for this ancient and evocative venue. 1. Alex Lewis, 2. Keiron Jones, 3. Alun Thomas, 4. David Mitchell, 5. Thomas Harris, 6. Brad Jones, 7. Aaron Caffell, 8. Peter Corkery, 9. Sam Wills, 10. Bleddyn House, 11. Matthew Sellick ©. Subs: 12. Rhys Jones, 14. Christian Evans, 15. Ashley Tandy (for 3, 79 mins), 16. Callum Tandy, 17. Rhys Tandy (for 9, 62 mins). 1. Mark Drew, 2. Lee Drew, 3. Lee Morris. 4. Alex Stewart, 5. Nathan Hardwick, 6. Alex Jenkins ©, 7. Jamie Martin, 8. Jason Lewis, 9. Nial Simmonds, 10. Tre Merrett, 11. Craig Ford. Subs: 12. Ellis Parks, 14. Macauley Corten, 15. Mo Hassan (for 10, 31 mins), 16. Joe O’Brien (for 8, 74 mins). Yellow Cards: Corkery (Treharris), M.Drew, Jenkins, Martin, Hassan (Newport YMCA). 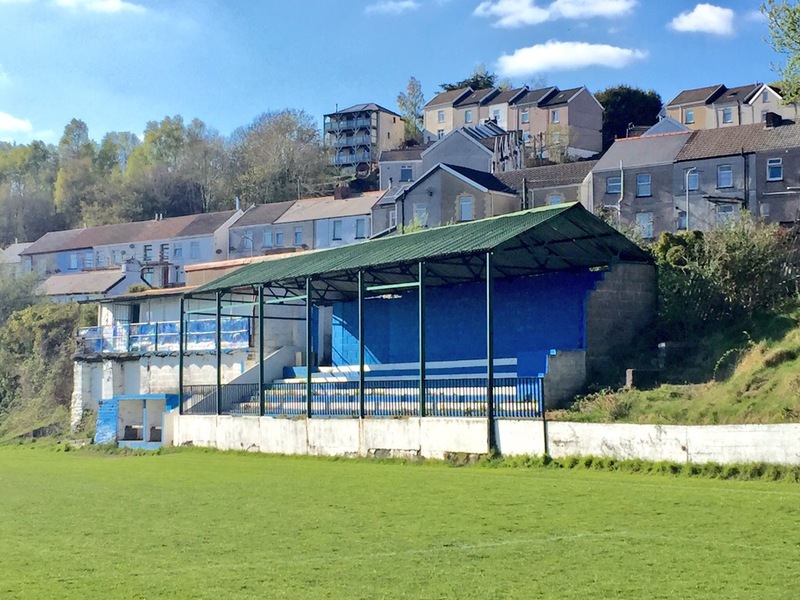 This entry was posted in Travel, Matches & Stadiums and tagged Athletic, Ground, groundhopping, League, Newport, Treharris, Welsh, Western, YMCA by peterrmiles. Bookmark the permalink.